TAHITI SPECIALS! BOOK NOW FOR BEST RATES! One Passenger Sails For Free! 6 Nights/7 Days, from $3510 per couple! 6 Days, from $3499* STAY 5 /PAY 3 in Overwater! 2 FREE Nights in Overwater! 2 FREE Night in Overwater! 2 FREE Nights! Stay 5 Pay 3! FREE Night plus Daily Breakfasts! TAHITI SUMMER SALE – BOOK EARLY AND SAVE! Free Upgrade upon availability at time of booking from Overwater Villa to Superior Overwater Villa. Choice of one Monoi Oil couples massage, or one 3 course dinner for two at the St Regis Bora Bora Resort, must confirm at time of booking. 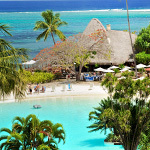 5 Nights at the Bora Bora Pearl Beach Resort with FREE Daily Breakfast! Bask in the beauty of Bora Bora with this 5-night vacation special at the charming Bora Bora Pearl Beach Resort. Includes a stay in a garden pool bungalow and free daily breakfast for two. 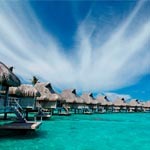 Sofitel Bora Bora Marara Beach Resort – FREE Breakfasts, & Includes 2 FREE Nights! Escape to the legendary island of Bora Bora with this 5-night limited-time special offer and receive up to two free nights in a luxury beach bungalow. 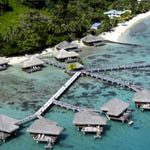 Overwater Stay, FREE Daily Breakfasts and one FREE Night! Relax in the paradise of Bora Bora with this 5-night vacation getaway. Stay in an Overwater Bungalow at Maitai Bora Bora where your stay includes: FREE daily breakfasts and one FREE Night! Experience the atoll of Rangiroa and take advantage of these great hotel savings when you stay at the Hotel Kia Ora and book early. Stay 6 nights in a Beach Bungalow and get 2 nights free and save an additional 10% on accommodations when booking early. Celebrate your honeymoon with this thoughtful getaway at Radisson Tahiti and Hilton Bora Bora Nui Resort, and marvel at the stunning aquamarine seascape from the privacy of your lagoon view suite. (*)Prices are in USD, ‘from’ per person, based on double occupancy, unless specifically noted. Single or extra person (triple) supplements apply. Package rates are inclusive of room tax & VAT, International air-inclusive packages rates also reflect airline fuel surcharge and U.S. airline taxes and fees. Strictly subject to availability at time of booking. Black out dates, minimum stay requirements, seasonal surcharges, currency exchange fluctuations, and other restrictions may apply. Prices, itinerary and conditions are subject to change without notice. Clients may be responsible for local city taxes, bed taxes and airport departure taxes not included with the international ticket. Information will be provided at the time of booking. Prices valid for low season (Nov.- March- holiday periods excepted), when booked 120 days in advance of travel. Rates may vary. 5 Nights, from $4259*$500 RESORT CREDIT! Includes FREE Breakfast & Dinner! ask for more Family Specials! KIDS FLY, STAY FREE & FREE KIDS CLUB! During your stay at Le Meridien Tahiti you will enjoy modern accomodations, white sand beaches that provide a gorgeous view of Moorea across the lagoon and much more. This package includes: 5 night stay in a deluxe ocean view room, free daily breakfast and airfare. Explore the lush landscapes of Tahiti and visit the captivating and culturally intriguing island of Huahine with this 5-night vacation value. Includes free daily breakfast on both islands. Feel the warm, welcoming embrace of Moorea and its people with this special 5-night island getaway at the Moorea Pearl Resort & Spa. Includes a private Beach Bungalow and free daily breakfast for two. Escape to the island of Moorea and experience its charm with this special 5-night vacation value. Includes free nights and free breakfasts. Amid lush tropical foliage and calm azure lagoons, you will find paradise at Le Royal Huahine. This package includes: 5 Night stay in an overwater bungalow, free daily breakfast and airfare. Make your vacation one to remember with this 5-night value vacation. Save more than $2500 in hotel savings with this great special at Le Taha’a Island Resort & Spa and enjoy 5 nights in an overwater suite. Experience a getaway on a secluded motu including free daily breakfast, a resort credit, flower bed and split of Champagne. Escape to the beautiful and secluded Hotel Kia Ora Resort & Spa on the remote island of Rangiroa with this 5-night promotion. Includes special honeymoon amenities and daily breakfast for two. Suspended between the sky and the waves, experience Polynesian panache in one of the Pacific’s best kept secrets, on a tropical island recognized and appreciated for its beauty with this 5-night package at the Tikehau Pearl Beach. You’ll enjoy inspired cuisine and unwind in accommodations that offer tasteful Tahitian details. *Custom Itineraries and Specials always available! Call for great service and latest promotions!